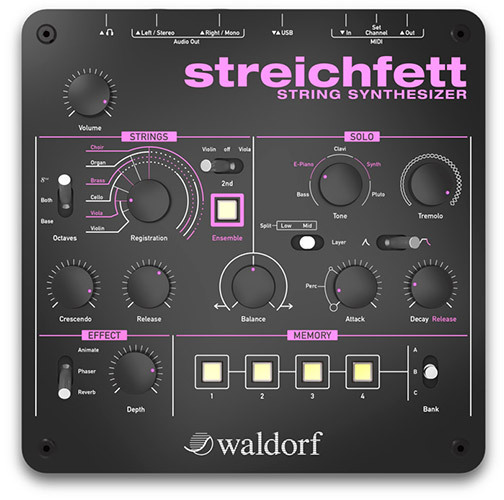 Waldorf announced Streichfett a new desktop synthesizer that strives to revive the 70s and early 80s polyphonic string synthesizers. 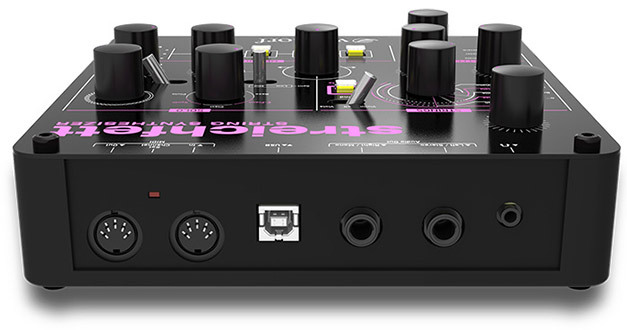 Streichfett has a dual sound engine featuring a fully polyphonic strings section and a monophonic solo section. The Ensemble Effect gives the String Section lush effects, while the Effects section adds adjustable Phaser or Reverb. Alternatively, the Effect section can be used to animate the strings registration, allowing spectacular sound morphs. The Solo Section offset presets named Bass, E-Piano or Clavi, and just like in typical string synths, there sounds have little to do with the name. Instead, these are shimmering and slightly percussive sounds that blend well with the string section. The User Interface is simple and easy to comprehend, but it controls a rather complex sound engine which is capable to deliver rich and creamy pads out of the rather small box. Twelve patches can be stored and selected in the Memory section, USB and MIDI are on board which make this one very attractive small desktop synthesizer. Full specifications can be found further down this post. Waldor Streichfett will ship later this spring for the price of €235,- More information can be found on Waldorf’s website.